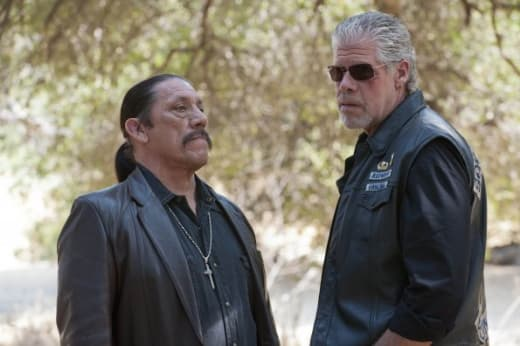 On Sons of Anarchy Season 4, SAMCRO joined forces with a Mexican drug cartel led by Danny Trejo's Romeo Parada. But this FX smash isn’t the first popular television show to get mixed up in the underground world of drug trafficking. How do our favorite not-so-Charming bikers compare to other programs and characters that have battled against/worked with drug cartels over the years? On BREAKING BAD, Walter White discovers he has cancer he panics and, using his chemistry knowledge, partners with ex-student/drug dealer Jesse Pinkman to create the most perfect form of crystal meth ever sold on the streets. But soon, the cartel is after the duo and they are in way over their heads. Elsewhere, Mary-Louise Parker stars on WEEDS as Nancy Botwin, a widowed suburban mom who turns to marijuana as a means for money to support her two sons. Throughout the series she becomes involved with the DEA and also international drug cartels, all to support her family. HBO's THE WIRE is set in Baltimore and each season focuses on a different facet of the city, including illegal drug trade. The many faces of character actors include a cop, a longshoreman, a drug dealer, a politician, a judge and a lawyer whose lives are all in peril. Finally, there's TRUE BLOOD. Following the complicated life of Sookie Stackhouse and her on-again off-again love triangle with vampires Bill Compton and Eric Northman, True Blood takes a closer look at the fictional town of Bon Temps and the dangerous events that continue to unfurl. These side stories include Lafayette as a drug dealer of vampire blood, a substance that acts as a controlled substance for humans. Sons of Anarchy Season 4 will be available on Blu-ray and DVD on August 28.